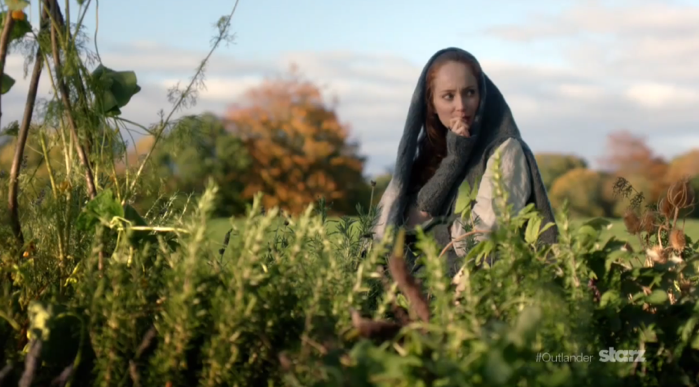 Lotte Verbeek (Geillis Duncan) conducted her very first Twitter Q and A for Outlander yesterday. Here is the transcript of the questions and answers that are relevant to Outlander. To find the complete Q and A session, head over to Lotte’s Twitter account. Q: What inspires you about Gellis? Q: Do you relate to your chr in anyway? A: Relate to Geillis in a lot of ways. though she probably goes a bit further and crosses more lines than i do! Q: Did you learn a lot about botany in medical skills, like Geillis uses it? A: Turned out I am naturally quite the herbalist! Q: Have you spoken Dutch with Àdhamh? A: Yes and he is great!! Q: How is your version of Geillis different than the character in the books? Or is she? A: Not sure; What do you guys think?? I am redder?? Q: What scene was your favorite to film and why? Q: Did you find mastering the Scottish accent to be challenging? Q: Do you have to chance to give/incorporate your own perspective to the character of Geilis? A: Great question! I think we all naturally do that. but absolutely loving the character helps. Q: Did you get to collaborate with Terry for your costumes? A: Absolutely! She is amazing because i am just as stubborn as #GD like to wear things my own way. Q: Are you intrigued by the character Geillis becomes in future books? Could be fun?! Q: Have you read all the books, knowing about your characters future? Q: What is the moment you really ARE Geilis? Can you”turn into Geilis” at any given second or do you need costume? A: Have the #redshoes been featured yet? that’s #GD‘s switch on button! Q: Why did you switch from dancing to acting? Q: Did you have any particular influence on how you portrayed this clever charming mad woman? A: hahaha! Producers were so incredibly generous and trusting they just gave me all the freedom in the world! Q: What characteristics do you share/differ with Dougal and Geillis? A: There is a team to help us get dressed #luckyus but the wearing we have to do ourselves. Jeans are more comfy. Q: How have the Netherlands responded to one of their own acting in a Scottish role? A: We are lucky to have Outlander as one of the first in the world! like everywhere, there is a great fanbase there. Q: Loved your debut as Geillis! What is your favorite part about playing her? Q: What’s next for you until Outlander season 2 begins production? Theater, movie, vacation? A: I am so lucky!! Already shot another film and two more to come. jay! Q: How do you unwind at the end of a long day of shooting? A: A car ride back from the studio, then sleepzz. Q: If you were on the crew instead of the cast, what job would you most like to do? Least like to do? A: Good question! I’d direct. Q: What did you enjoy most about working in Scotland? A: If you see through the rain, it is the most raw, magnificently beautiful country you’ll ever see. sunsets! Q: Which episode are you currently filming? A: I am rarely aware of switching languages, have been doing foreign films since I graduated, 6 years ago! Q: What was your favorite costume to wear? A: Let’s see. There was ‘the monkey jacket’ ‘the moth’, ‘the raven’… can’t choose!! Q: Are you always a hair twirler, or is that just a character trait? A: hahah! One of the many things I have in common with #GD. Q: What is your favorite characteristic of Geillis? A: Can i pick 2? playfulness and passion. Q: Will we be seeing any face to face time between Geillis & Dougal? This entry was posted in Àdhamh Ó Broin, Graham McTavish, Interviews, Lotte Verbeek, Production News and tagged Adhamh O Broin, Geillis Duncan, Graham McTavish, Lotte Verbeek, Terry Dresbach, Twitter Q & A by Sarah Ksiazek. Bookmark the permalink.